Community Forklift provides home repair supplies and other household essentials free-of-cost to families and individuals with low incomes. Since 2011, Community Forklift has provided over $150,000 of materials to our local neighbors in need to improve their homes! 1. First, click this link to read the attached letter for more information about our program. The letter details how folks can qualify, the types of verification we need, and what to expect. 2. Then, FILL OUT OUR APPLICATION by clicking here. This is the only way to apply for our program. Make sure to fill out all the required fields and click Submit at the bottom. The form will show you a message to confirm you successfully sent it to us. *Please note: It may take us a few weeks to review your application. We only have one Community Services Coordinator and hundreds of applications, but we are working as quickly as we can and look forward to meeting you! 3. Come in for your scheduled appointment time with our coordinator. Once you are contacted by our new staff member, we’ll give you an overview of how the program works and you’ll be scheduled for an appointment. During this time, we’ll go over all of our policies and procedures. Then, we’ll either award you specific materials, or get you set up with a grant to come back to the warehouse at your convenience. 4. Arrange transportation for your materials and take them home, free of cost! Please note that we have waiting lists for all appliance requests at this time. Unfortunately, we are not receiving enough donations to keep up with demand, but we are working through the lists as quickly as we can. Thank you for your patience. Girl Scout Troop 6899 turned a sturdy old cabinet into a little free pantry, dubbed a “blessing box.” It’s located near St. Jerome Catholic Church and Hyattsville Elementary School. 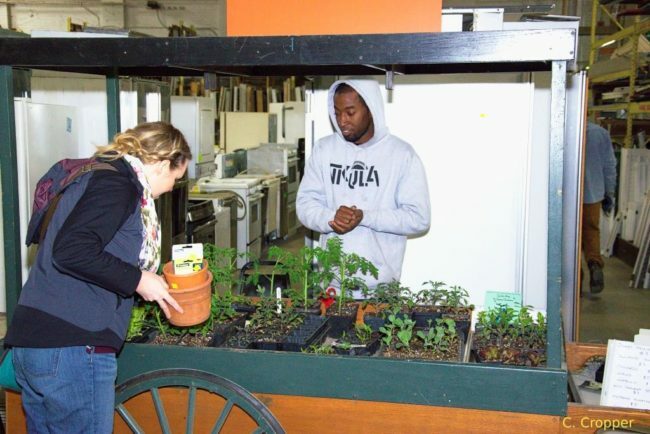 Community Forklift provides mini-grants of store credit to nonprofits, schools, and volunteer groups who need building materials for projects that serve the greater community. Since 2011, Community Forklift has worked with 400+ organizations and has awarded over $250,000 in store credit for organizations to pick up free materials from our warehouse. We have also loaned out over $18,000 in materials for art installations, theater productions, and other community events. 1. First, click this link to read the attached letter for more information about our program. The letter outlines the program and what to expect. We also regularly meet and advise other small businesses who are interested in locating green businesses nearby. We work with the Port Towns Community Development Corporation on economic development, including the EcoDistrict Project for which Community Forklift serves as an anchor organization. 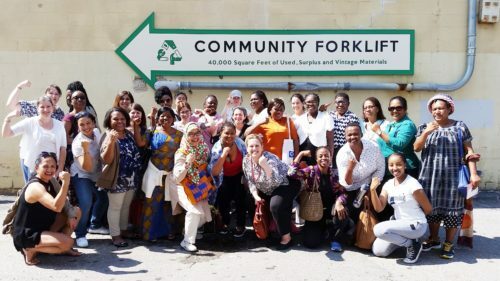 Community Forklift is an internationally-known reuse center that offers a green business model promoting sustainable development. In fact, we have been voted DC’s “Best Green Business” by the Washington City Paper every year since 2013! Our team has hosted everyone from preschoolers and scout groups to grad students and Department of State visitors to teach groups of all ages about topics such as social entrepreneurship, waste reduction, and the reuse movement. If you would like to schedule your own tour or would like for us to visit your school or organization, please contact Events(at)CommunityForklift.org or call our Events Coordinator at 301-985-5180 (extension 302). Each year, PLAN International brings attendees from their Global Women in Management workshop to visit our operation. Please sign up for our blog and newsletter to receive all of our updates and details! To find out more about exhibiting, vending, or playing music during one of our events, please complete our partner interest form. Note: It is free to vend at many of our events, so spots fill up fast. We do give higher priority to vendors who offer green or upcycled items, so please let us know how your product or service is eco-friendly, and how you use salvaged materials in your work. 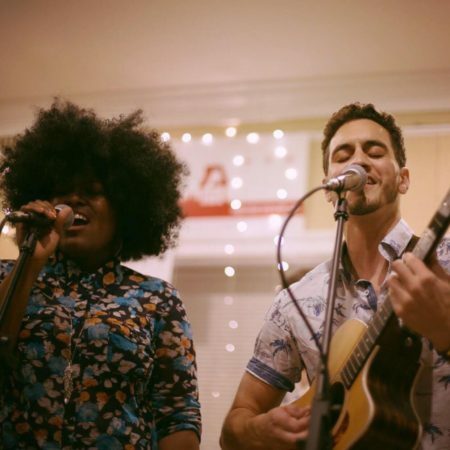 Our music calendar can fill up 6-12 months in advance, so bands should complete the application early! If you have any questions, please contact our Events Coordinator at Events@CommunityForklift.org or 301-985-5180 (extension 302). 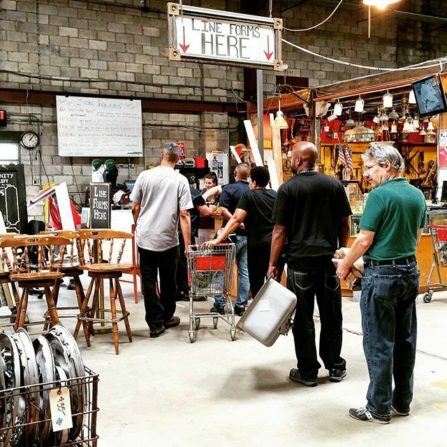 In addition to our community festivals, we also offer DIY reuse & renovation workshops throughout the year. These are free of charge. Whether it’s how to build a cold-frame for starting seeds, or a slideshow of a local renovation, we explore different ways to reuse and go green at home. We’re always scheduling new workshops, so check our calendar page to see what’s coming next. 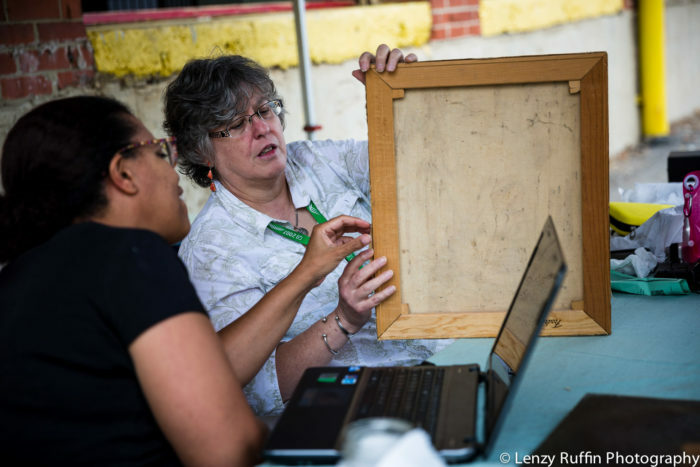 Do you have experience in reuse, upcycling crafts, old home repair, green living, or historic preservation? If so, please share your workshop idea here – and spread the word to your handy & creative friends, too! Keep in mind: we do offer gift certificates to workshop presenters as a token of appreciation. We also announce the workshops in our newsletter and social media, which reaches over 20,000 people. So if you’re a contractor or artisan, it’s a great way to serve your community, get some publicity, and meet potential clients. Are you having a community festival or event? 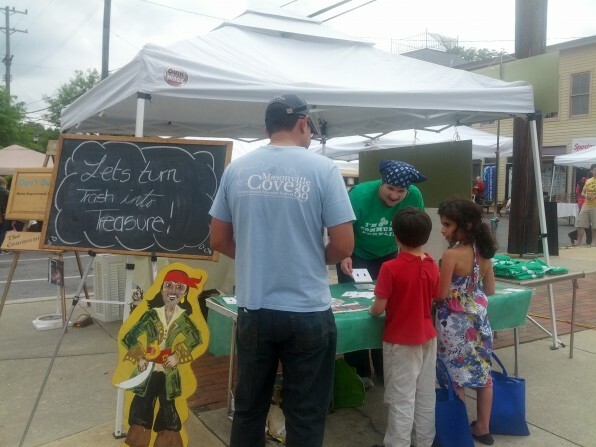 Our outreach team would love to be there to support your efforts and educate your community about reuse! Please contact us at Events(at)CommunityForklift(dot)org about exhibiting or speaking at your upcoming event. Come get your hands dirty for a good cause! Volunteer at the Forklift for a few hours, a full day, or even on a regular basis. 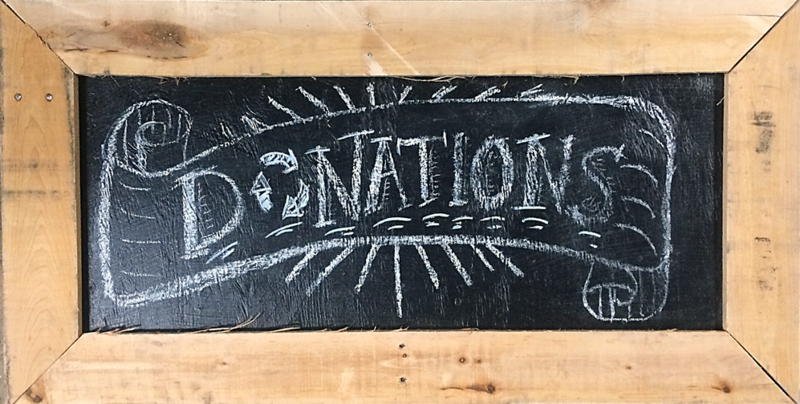 Opportunities for individuals and groups include organizing and cleaning donations, helping to design or rearrange sections of our store, assisting with community events, and more. It’s a great team-building activity for coworkers and social groups. We can even arrange special projects or more skilled tasks if you’re handy and have a good set of work boots! Please contact us at least two to three weeks in advance of the day you would like to volunteer. Volunteers must be 16 or older. Seniors are encouraged to apply – you do NOT need to lift heavy items to be useful! Except during special events, we are usually only available to host volunteers between 10 am and 5 pm. We are generally unable to accommodate volunteer groups on Saturdays. If you are curious about volunteering, please fill out our volunteer inquiry form below. We will get back to you as soon as possible to set up an orientation for an individual volunteer, or confirm the date for a volunteer group. Please note: During the busy season, it may take up to two weeks to respond to volunteer inquiries. We will be unable to accommodate volunteers who need to start their service immediately. Community Forklift offers internships every spring, summer, and fall. This is an excellent opportunity to learn more about green business and gain valuable work experience in the rapidly growing industry of reuse and sustainability! Find more information about our internship program here.